← White Wolf meets Friends? This is probably in the ‘out of nowhere’ category, but thought I would do a quick post endorsing the new Valentine’s Day Junior Mints. We are both Junior Mint fans – I prefer AMC movies over Regal because the first has Junior Mints available to sprinkle in my popcorn. Well, that and other reasons. But honestly, the mints are in the top ten. These days, movie popcorn tastes a bit overly salted and greasy to me, but a bit of candy goodness still helps it go down well. 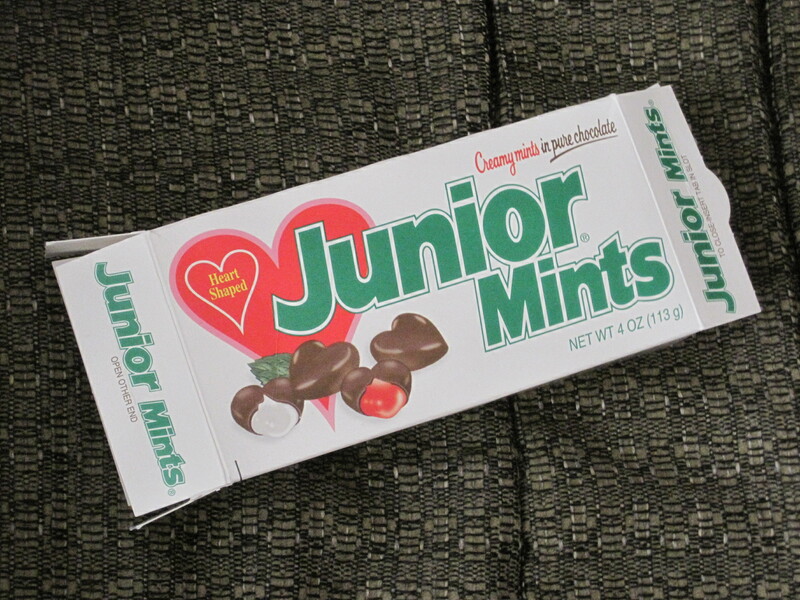 I think the best thing about these Junior Mints is that they are bigger, apparently to accomodate the new heart shape. This gives a nice boost to the mint part of the candy, which I greatly appreciated. The chocolate is good as well, but I always thought the mint was the best part and so appreciate the boost. Also in the ‘variety’ column you can include the red mints, which have a more sugary taste that actually is not as good as the regular ones but had a nice contrast. These were a pretty random free day whim buy, and I do not know where you can buy them (we found ours in an end cap at Vons). But if you get a chance to pick them up, I would recommend giving them a try, for sure. The only question now is which is better, Junior Mints, or the York’s Peppermint Patty? I liked the increased mint to chocolate ratio, but yes, the reds seemed to be more liquid than creamy – perhaps a side effect of red food coloring. The artsy Regal we saw “Black Swan” at had Junior Mints, but the main ones don’t as a rule.